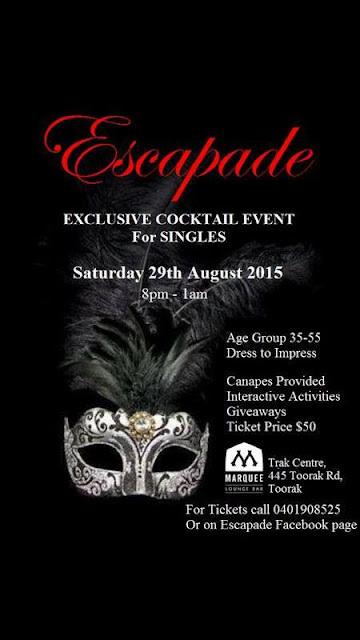 ESCAPADE.... Have you heard about this new event group for singles??? Escapade is a Single’s group that creates exciting events at venues across Melbourne for singles of all ages. The events range from interactive Single’s nights, wineries, picnics for parents with children and many more events to come. Here is a spiel about their latest single's event... The Single’s event with a difference. Escapade’s Exclusive Cocktail Event will have great music to get you moving, exquisite Canapés throughout the night, interactive activities that will make you laugh and giveaways from our sponsors. The Event is on the 29th of August 2015 and is exclusive to only 100 ladies and 100 gentlemen ONLY. Tickets are running out the door so be quick to get yours. The Venue is the Marquee Lounge Bar in Toorak which is a classy venue with a sensational atmosphere. G.S Soulstice said....“I don’t want to be the other half of your soul. I want to be the one who reminds you that you’re already whole”. You just may find that other half at one of their Exclusive events. Looking forward to hearing all about the night and hopefully you can find that “someone” you are looking for.